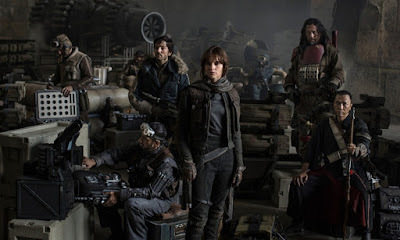 The first Star Wars Anthology film, Rogue One: A Star Wars Story, is less than a year away and still very little is known about the film. Rogue One, directed by Gareth Edwards and starring Felicity Jones, Forest Whittaker, and Donnie Yen, will tell the story of how the rebels stole the plans to the first Death Star. Other than that, details about the series are sparse. Now, JoBlo has released some new details (and offer confirmations of others) about the film. As usual, there is a chance this may not be true but if you are trying to avoid all Rogue One spoilers stop reading now. This is your SPOILER ALERT! Rumors began swirling about stormtroopers in all-black costumes appearing in the film late last year and we can confirm that they will be in the movie. Our sources indicated that they are often referred to as "Death Troopers", although no mention if the commonly referenced "Shadowtrooper" from the Legacy Universe would be used. (also, recall that Donnie Yen shared an image of some helmets a while back, including a black one). One of the prominent characters in the film is a droid that works with the rebels, specifically Felicity Jones' group, that is said to be a "scene stealer" in the film. It was originally an Empire droid and has been repurposed to serve the rebel alliance. He's two-legged and a dark grey or black color. In terms of appearance, the droid has long arms and legs and is very different than a typical protocol droid like C-3PO. Could this be the mo-cap character that Alan Tudyk is playing? Time will tell. So far we don't have a confirmation on any of the character names, but you can add this one to the puzzle: "Cashen" is the name of one of the key players, although which we can't say. It could be spelled differently as well, in that whole "Star Wars" way (i.e. Kashen or Kashyn, etc.). Speculate away on that one, but hey...it's a name. There will be a new Tie Fighter design and AT-ATs will be featured in the film. Lastly, addressing those Darth Vader rumors, we can confirm that Darth Vader will be in the film and is expected to have a larger role than originally thought. How big or how involved we can't say specifically, but expect to see the return of one of Star Wars' most infamous characters to the big screen. None of these are ground breaking details, but they do add to some of our understanding of what the film will be. The name Cashen does sound like a good Star Wars name. And the idea of a converted-Imperial droid working with the Rebels is an intriguing one. as a spin off - do you think we can expect to see someone else besides JW handle the soundtrack?